Here is a look at the wild wild world of C&J circa 1966, with accompanying text from the December 1966 issue of Teen Screen, and comments from Chad, some 30+ years on! Teatime is an English tradition, as we all know. Chad and Jeremy are English. Therefore, they drink tea at teatime. Regardless of where they happen to be. They just happened to be disporting themselves with some dolphins at Marineland one day, when teatime arrived (as most times have a habit of doing). What to do? By the time they left the dolphins to disport by themselves, dried off, changed clothes, and made it to the tea table ...tea time would have passed. But Chad and Jeremy are Britannia-enterprising lads. 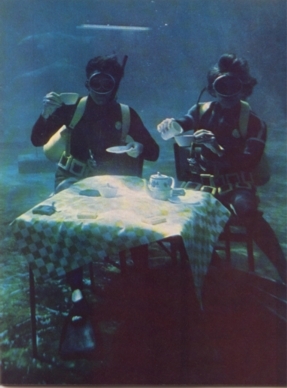 They had tea brought to them - under water. The British are such a traditional sort. "I remember rocketing to work in my Corvette on a deserted freeway at six in the morning. I was on my way to Marineland. I knew we were going to dive in the tropical tank and I was stoked. This was back in the days of the Ed Sullivan style TV variety show - acrobats, opera singers, performing mice and the occasional rock star. This program was no exception. The performers were the Beverly Hill-billies, a couple of killer whales and Chad & Jeremy!" 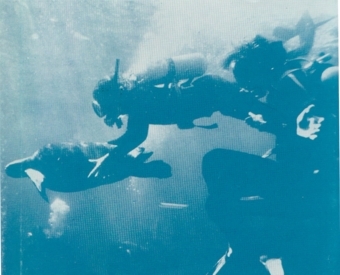 "Diving in the huge tropical tank was a blast. I remember hitching a ride on the back of a giant turtle. 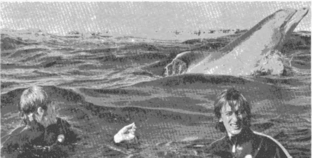 (This shot was used on the sheet music for "Distant Shores", and is on the left here.) I also remember the expressions on peoples' faces as they gawked at us through the observation windows. It was interesting to observe from the fishes' point of view. It felt as though we were free and the humans were the ones who were confined."